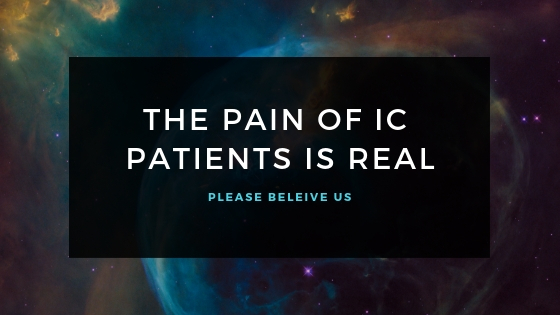 "Your pain is not real, you are imagining the pain"
Most IC/BPS patients have heard this at least once during or after the diagnosis of interstitial cystitis. Not only patients from India but patients from all over the world have similar experiences. They have either heard it from a friend, a colleague, a family member and in the most unfortunate situation from his/her doctor. Why is this? The pain in IC can be challenging and confusing for the doctor in most cases however that doesn't mean that there is no pain. Many patients have compared IC pain equivalent to cancer pain. Pain is the major component of this disease and the doctors should empathize with the patient and do not call them insane. If a general physician is unable to understand the pain then the patient should be referred to a pain specialist for better understanding.